Sanjib is 11 years old boy who was born in 2006 June 24 through Sukuram Praja who dead 2012 September 20, and Pavimaya Praja who dead on 2014 September 13. His parents were poor and had no land or property. His father dead due to Pneumonia and his mother dead both kidney failures. They didn't had land or property, but they had a pairs of oxen and three goats. Sanjib is healthy and very attractive looking. He has a big sister but she is married. He also has a brother who is dumb. 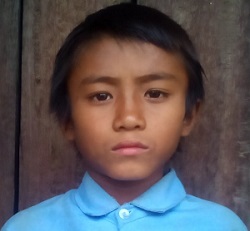 Sanjib currently lives in Raksirang-9, Botbari, Makwanpur. The name of the School is Shree Praja Jagriti Nimna Madhyamik Bidhyalaya. His daily routine includes, wake up and wash face, brush teeth, eat breakfast, do homework and get ready for school. He likes all kinds of food; they don’t grow rice, because they don't have paddy field. They eat Dhido, which is traditional food of Nepal, similar to halva, made by boiling water and putting the flour of millet or wheat or corn flour. It could be best to serve with chicken soup. He likes to play football in free time which is near the river bank. He lives in remote village and has no idea of how many kinds of clothes people wear. So he likes all types of clothes. He reads in class 4 in the government school. Nearest town from their village is 2 hours in walk through the crossing of rivers which makes impossible during the summer. He has something to say about marriage. He has seen boy of 14 years of age and 12 years old girl getting married, that is very common among the Praja people, and some time Praja people are called Chepang. He has strong determination about marriage. He said he is going to marry only when he becomes 20 or when he crosses 20. He has a very common ambition, and that is to become a carpenter. He becomes very angry when someone teases him or provokes him for no reason. He does not like to fight. When the letter from his sponsor was handed over to him, he at first could not believe it. When he read he was very happy and he put letter inside the Bible. He loved the letter and did not leave his Bible unattended because inside the bible he kept the letter from the sponsor. You can send gifts to Sanjib in this address.